A study was carried out on the effects of Fusarium oxysporum and Macrophomina phaseolina on the proximate compositions of Jatropha curcas seeds. The proximate composition of the various nutrient component (Dry matter, Moisture, Lipids, Free fatty Acid, Carbohydrates, Ash, Fibre, Crude protein and Amino acid) in both fungus-inoculated and uninoculated seeds at the incubation period of 7 days were measured by the methodology proposed by the Association Official Analytical Chemists . The results obtained from each food component were subjected to statistical analysis using the Analysis of Variance (ANOVA). In the results of the proximate analysis, Fusarium oxysporum and Macrophomina phaseolina caused significant increase (P=0.05) in moisture content 7.0% and 6.0%, crude protein 2.1% and 1.7%, and 0.2% and 0.7% ash, respectively in seeds inoculated at room temperature (28 ± 2°C) for 7days when compared with uninoculated controls. There was a remarkable reduction of 11% and 10.5% in dry matter, 0.8% and 0.2% in carbohydrate, 5.0% and 3.3% in lipids, 2.6% and 5.7% in fibre content of the seeds inoculated with Fusarium oxysporum and Macrophomina phaseolina, respectively when compared with their controls. The results are discussed in relation to the changes in the nutritional composition of the seeds due to the activities of these pathogenic fungi. Jatropha (Jatropha curcas L.) or physic nut is a drought resistant specie, which is widely cultivated in the tropics as a living fence. It is a deciduous large shrub or small tree 5 (-8) m tall, belongs to the genus Jatropha which consists of over 170 species. It belongs to the Euphorbiaceae family, producing oil containing seeds. Four of the eight species recorded in West Tropical Africa and described by Hutchison et al. occur in the Niger Delta. These are J.curcas L., J.gossypifolia L., J.multifida L. and J.podagrica. Ratha et al. described 12 species of Jatropha curcas in india using morphological characters. Nwokocha et al. confirmed the relatedness of the 4 species present in the Niger Delta from the phytochemical studies carried out on the leaf, stem, root and seed of four Jatropha L. Species. Jatropha curcas is a plant with high potential source of biodiesel production. The oil content and fatty acid (FA) composition of J.curcas seeds are of vital importance. The oil content of J. curcas seeds, together with the seed yield, remarkably influences its economic value, especially for large scale agricultural production. Furthermore, probably due to its toxic characteristics, the area of research on the nutritional importance of physic nut seed has not been fully harnessed. This present study is therefore embarked upon to evaluate the effect of Fusarium oxysporum and Macrophomina phaseolina on proximate compositions of J. curcas seeds. The Physic nut seeds (Jatropha curcas L) used in this study were sourced from Federal College of Forestry, Jos, Plateau State. The research work was conducted at the Mycology/ Plant Pathology and Physiological Unit of the Department of Plant Science and Biotechnology, University of Port-Harcourt. Fifty grams each of healthy Jatropha curcas seeds were weighed into individual 250 ml Erlenmeyer conical flasks. The flasks containing seeds were sterilized at 121°C for 15 mins to eliminate any internal and external seed borne micro-organisms . After sterilization, each flask was allowed to attain room temperature. 20 ml of sterile distilled water was added to individual flask and shaken gently to wet all the seeds, create humid and conducive environment for the test fungi growth. Each flask containing seeds was individually inoculated with a disc of 7 day old spores of each fungus of Fusarium oxysporum and Macrophomina phaseolina respectively obtained from the pure culture of isolated fungi from the infected seeds. This was carried out with a 1.5 cm diameter sterile cork borer. The inocula were spread properly by gently shaking the flask for about 15 minutes to obtain uniform distribution of the mycelium among the seeds. The control flask were maintained without fungi added to it. The entire flasks which include the fungi inoculated and uninoculated seeds were incubated at room temperature for 7 days. At the end of the incubation period, two flasks of each fungal treatment and one flask for control were collected for biochemical analysis. The seeds in each flask were transferred into a pre-weighed watch glass, dried at 45°C for 24 hours and the spores and mycelia of the fungi removed by sieving . The proximate composition of the various nutrient component (Dry matter, Moisture, Lipids, Free fatty Acid, Carbohydrates, Ash, Fibre, Crude protein and Amino acid) in both fungus-inoculated and uninoculated seeds at the incubation period of 7 days were determined following procedures recommended by the Association Official Analytical Chemists . The data obtained from each food component were analysed statistically using the Analysis of Variance (ANOVA). 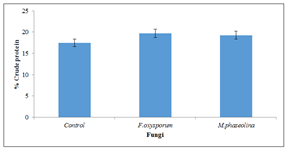 The results of the biochemical analysis of Physic nutseeds inoculated with Fusarium oxysporum, Macrophomina phaseolina and uninoculated controls incubated for 7 days are presented in Figure 1. The test fungi grew well on the Physic nut seed and caused appreciable changes in the nutrient component of the seed. There were significant increase (P=0.05) in the moisture, ash and protein, content of the seeds inoculated with the test organisms compared with the control seeds. (Figures 1, 5 and 7) There were significant decrease (P=0.05) in dry matter, lipid, carbohydrate and fibre content of the seeds inoculated with fungi when measured with the control. (Figures 2, 3, 4 and 6). There was significant (P=0.05) increase in moisture content of seeds inoculated with Fusarium oxysporum (37.1%) and Macrophomina phaseolina (36.1%)when compared to uninoculated seeds (Figure 1). Figure 1: Moisture content of inoculated and uninoculated Jatropha curcas seeds. The dry matter was significantly (P=0.05) reduced by Fusarium oxysporum (58.9%) and Macrophomina phaseolina (59.4%) compared with the uninoculated control (Figure 2). Figure 2: Dry matter of inoculated and uninoculated Jatropha curcas seeds. 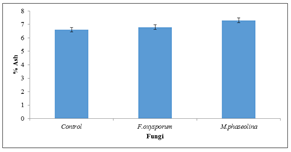 The lipid content increased significantly(P=0.05) in all the samples inoculated with Fusarium oxysporum and Macrophomina phaseolina in contrast with the uninoculated control (Figure 3). Figure 3: Lipid content of inoculated and uninoculated Jatropha curcas seeds. The carbohydrate content of inoculated seeds were significantly (P=0.05) reduced by all the test fungi as compared to the uninoculated seeds (Figure 4). Figure 4: Carbohydrate content of inoculated and uninoculated Jatropha curcas seeds. There was significant (P=0.05) increase in ash content of seeds inoculated with Fusarium oxysporum (6.2%) and Macrophomina phaseolina (7.3%) respectively (Figure 5). Figure 5: Ash content of inoculated and uninoculated Jatropha curcas seeds. A significant (P=0.05) reduction of crude fibre content was observed in samples inoculated with Fusarium oxysporum (7.51%) and Macrophomina phaseolina (4.39%) when compared to uninoculated samples (Figure 6). Figure 6: Crude fibre content of inoculated and uninoculated Jatropha curcas seeds. There was significant (P=0.05) increase in protein content of seeds inoculated with Fusarium oxysporum by (19.6%) and Macrophomina phaseolina by (19.3%) over the uninoculated control (Figure 7). Figure 7: Crude protein content of inoculated and uninoculated Jatropha curcas seeds. The moisture content of fungus-inoculated seeds increased when compared to uninoculated control. There was a significant difference at P=0.05, Fusarium oxysporum had the highest moisture content (37.06%) followed by Macrophomina phaseolina (36.10%). The increase caused by fungi is due to the utilization of some of the components of the seed as food nutrient thereby converting them into water in the process. Similar results were obtained by [5, 6]. Also, Amienyo et al. reported similar result in Sweet Potato inoculated with fungi. Deteriorative reactions occur more readily in seeds at higher moisture content and subsequently, this condition constitute hazard to the longevity of seed survival . The inoculation of Jatropha curcas seeds with pure cultures of Fusarium oxysporum and Macrophomina phaseolina were incubated at ambient temperature for 7days, underwent different degrees of deterioration. Fungi secretes pectic enzymes which spread rapidly through the intercellular spaces of parenchyma down the middle lamella of the host cells tissue, a process which results in the maceration of tissues. The activities of these enzymes may be responsible for the decrease in Dry matter and increase in moisture content. From the biochemical analysis carried out it was observed that there was a decrease (P=0.05) in dry matter of fungus inoculated seeds compared with that obtained using uninoculated control. In this study, Fusarium oxysporum had the highest decrease compared to Macrophomina phaseolina, this agrees with earlier report of  that fungi produces extracellular cellulolytic and pectic enzyme and secondary metabolites which may be responsible for the drastic depletion of dry matter. The extracted lipid from the seeds inoculated with Fusarium oxysporum and Macrophomina phaseolina decreased from the uninoculated control (32.17%). Fusarium oxysporum (27.27%) and Macrophomina phaseolina (28.97%) respectively. This is in agreement with the report of Ward et al. who reported that fungi caused a decrease in total oil of groundnut. In accordance with these, Ogundero  explained that the decrease in oil content could be due to the hydrolysis of oil to free fatty acid (FFA). This occurred at different rates for the individual micro-organisms. The free fatty acid expressed as percent Oleic acid for both inoculated and uninoculated seeds increased. Macrophomina phaseolina induced the highest value of free fatty acid of (56.6%) while seeds inoculated with Fusarium oxysporum had the lowest free fatty acid value of (53.61%). The increase in free fatty acid seems to suggest that these fungi have high lipase activity. Similar to the result of this present study, the increase in the formation of free fatty acid was found to be associated with a decrease in total oil, in line with Ward and Diener,  who reported increase in free fatty acids of groundnut inoculated with Aspergillus sp. and noted that the fungus utilized the free fatty acid as carbon source. There was significant (P=0.05) decrease in the carbohydrate content of the inoculated seeds when compared to the control. 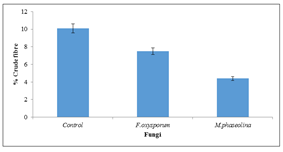 The highest reduction was recorded in seeds inoculated with Fusarium oxysporum thereby showing the amylolytic activity of the fungus compared to Macrophomina phaseolina. Solomon  mentioned that carbohydrates are usually hydrolyzed to glucose and then used as a source for carbon and energy for microbial growth, which also explains the decrease in carbohydrate content observed. Raimbualt  has attributed the depletion in carbohydrate to transformation of starch and mineral salts by fungi (especially Aspergilli) into fungal protein. Embaby et al. reported that, most reduction and loss percent were found with fat, carbohydrate due to Fusarium oxysporum in legume seeds. The result of the investigation revealed that in comparison with the uninoculated control, the presence of the individual microorganism in the flasks increased the ash content of the seeds, in agreement with Ataga et al. . The crude fibre content decreased in all the seeds inoculated with the test fungi. This is in agreement with the report of Onifade et al. about a decrease in crude fibre content, in the enrichment of sweet potato flour using A.niger and Saccharomyces cerevisiae. El-Tinay et al. explained that crude fibre tends to decrease during fermentation, this he concluded was a result of being utilized by the fermentation microbes. In this study, the fungi, caused increases in protein when compared to the control. The significant increase (P=0.05) in protein content by Fusarium oxysporum and Macrophomina phaseolina could have resulted from slight protein synthesis of enzyme proteins or other constituents . Several studies have shown that mold form proteases during fermentation which may result in increased protein amino acid. This result agrees with the report of Nwaukwu and Ataga . In conclusion, the diverse ways the fungi affected the nutritional value is of paramount importance. Due to the high value of the main plant, the need for ways to achieve disease free seeds, which result to healthy useful plant parts, is key. AOAC. Association Official Analytical Chemists. Official Method of Analysis (13th Edn) Washington DC (1995): 1018. Hutchison J, Dalziel JM. Floral of West Tropical Africa, Vol.1. Part II. Crown Agent for Oversea Governments and Administrations, London (1958). Ratha PK, Paramathma M. Potentials and Jatropha species. wealth of India Curr Sci 97 (2009): 1000-1004. Nwokocha AB, Agbagwa IO, Okoli BE. Comparative Phytochemical Screening of Jatropha L. Species on the Niger Delta. Research Journal of phytochemistry (2011). Nwaukwu IA, Ikechi-Nwogu C. Biochemical Changes induced by the Effect of Six Pathogenic Fungi on Dialium quineense: Black Edible Fruit. International Organization of Scientific Research Journal of Pharmacy and Biological Sciences 2 (2012): 20-24. Amienyo CA, Ataga AE. Biochemical changes induced by four rot fungi on Sweet Potato (Impomoea batatas (L) Lam) tubers. Nigerian Journal of Microboilogy 20 (2006): 1334-1338. Vashisth, Nagarajan. Deteriorative reactions occur more readily in seeds at higher moisture content and subsequently, this condition constitute hazard to the longevity of seed survival (2009). Okonkwo SN, Amund OO, Ogunsanya CO. Microbial rotting and preservation of banana fruit (Musa sapientium L) in Nigeria. Microbes. Letter 44 (1990): 175-176. Ward HS, Diener UL. Biochemical changes in shelled peanuts caused by storage fungi in Effect of Aspergillus tamari, Four species of A.glaucus group and Penicillium citrinum. Phytopathology 51 (1961): 244-250. Ogundero VW. Hydrolysis of vegetable oils and triglycerides by thermotolerant and zoopathogenic species of Aspergillus from Nigeria Palm Produce. Mycopathogia 77 (1992): 43-46. Solomon B. Microbial conversion of hydrolysed maize and sorghum dusts to high protein foods. Nigerian Food Journal 5 (1987): 1-11. Raimbualt M. Fermentation of milleu solid croissanceb de champing ons filamentoux sur substrats amylases edited by Orstom-Paris, Sorie Travicuet Document no (1981): 127-291. Embaby EM, Mona M, Abdel-Galil. Seed Borne Fungi and Mycotoxins Associated with Some Legume Seeds in Egypt. Journal Appl Sci Res 2 (2006): 1064-1071. Onifade AK, Atum HN, Adebolu TT. Nutrient enrichment of Sweet potato (Ipomoea batatas L). Global Journal of Pure and Applied Sciences 10 (2004): 31-36. El-Tinay AH, Abdel-gadir AM, EL-hidal. Sorghum fermented Kisra bread I: Nutritive value of Kisra. Journal of Science and Food Agriculture 30 (1979): 859-361. Kuo UH, Bau HM, Quemener B, et al. Solid State fermentation of Lathyrus sativus seeds using Aspergillus oryzae and Rhizopus oligosporus SP T-3 to eliminate the neurotoxin B-ODAP without loss of nutritional value. Journal of Science, Food and Agriculture 69 (1995): 81-89. Nwaukwu IA, Ataga AE. Biochemical Changes induced by five Pathological Fungi on seeds of Hibiscus sadariffa (YAKWA) Scientia Africana 12 (2012): 1-6. Christensen CM, Kaufman HH. Grain storage. The role of fungi in quality losses. Univ. Minnesota, Press Minneapolis (1969). Osborne Voogt. The analysis of nutrient in foods. Academic Press, London (1978): 159. Citation: Isalar Oluwatoyin F, Ataga Anthony E. The Effect of Fusarium Oxysporum and Macrophomina Phaseolina on the Proximate Composition of Jatropha Curcas Seed a Biofuel Plant. Journal of Biotechnology and Biomedicine 2 (2018): 001-008.